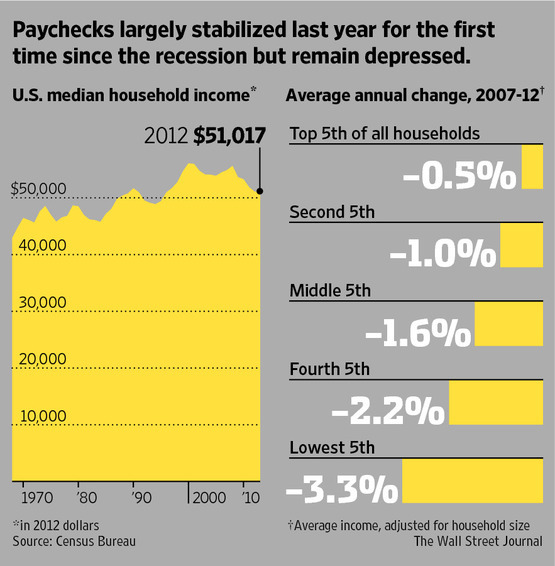 The income of the typical U.S. family stabilized last year for the first time since the recession. 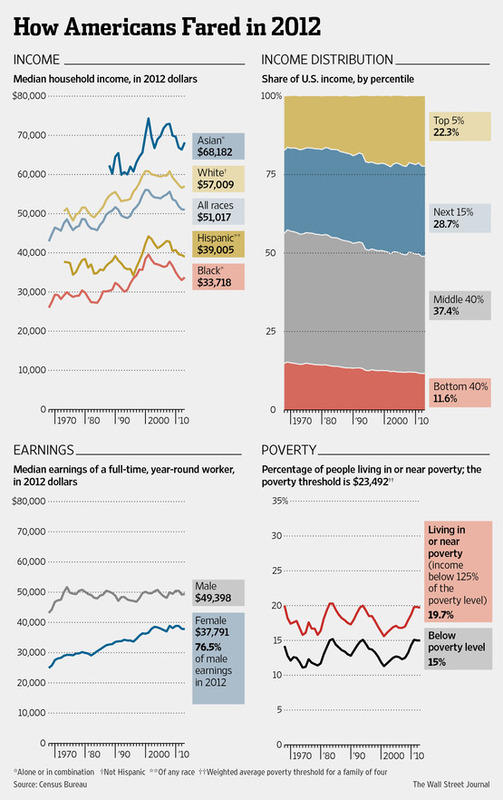 The bottoming-out follows four years of declines that pushed incomes to their lowest levels in nearly two decades. Consumers may soon feel the benefits of an improving job market that has seen unemployment drop from a peak of 10% to 7.3% this August. A rally in stocks also has boosted incomes for some Americans, along with rebounding real-estate prices. The prices paid for medical care in July rose just 1% from a year earlier, the slowest annual rate of growth since the early 1960s, according to Commerce Department data. 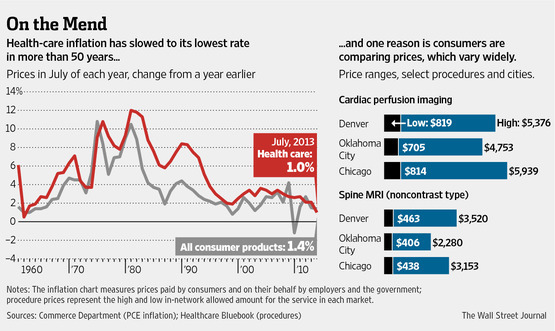 Health-care increases now trail overall inflation, which itself has been historically slow in recent years. The recent slowdown in medical inflation is partly the result of less-generous health plans forcing patients to pay more attention to prices, doctors say. Making the optimal career choice is a very personal and complex process of identifying your passions and your strengths, but tempering this with the economic realities of income expectations. Anthony Carnevale and colleagues at Georgetown University have published an extensive study of the economic value of college majors. Your college major has a greater influence over your income than where you go to school. 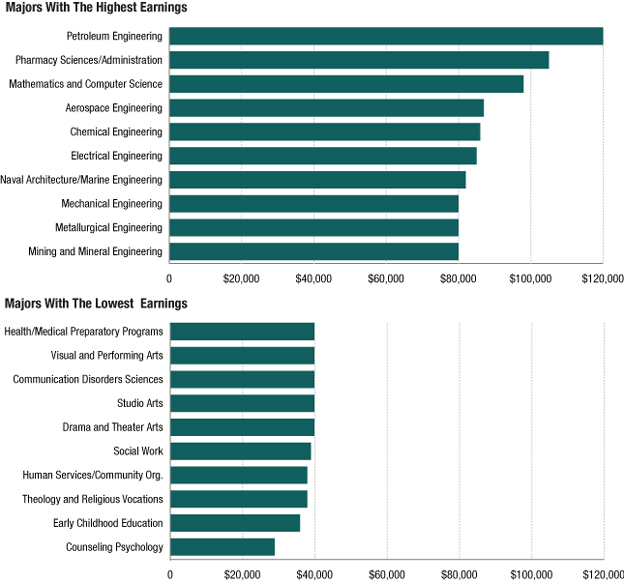 Majors with the highest earnings are concentrated in the engineering disciplines, computer science and pharmacy science. Majors with the least earnings include the arts, social services, and education. The Georgetown study, What’s it Worth? The Economic Value of College Majors, is excellent food for thought if you or someone you know is actively contemplating college majors (download full report here). 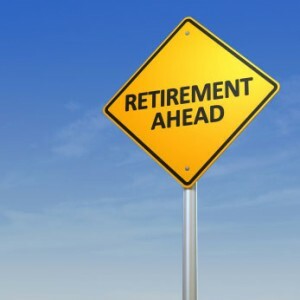 Is Your Financial Advisor Close to Retiring? Financial advisors as a group are growing old in a line of work with a very slow replacement rate. According to Accenture, the average age of a financial advisor in the U.S. is 50 and advisors above the age of 60 control $2.3 trillion of client assets. Understand the coming transition. Ask your advisor about her or his retirement date and how your account will be handled. Do you want to stay with the firm or try some place new? Look for an upgrade. You may like your current advisor but there’s always room for improvement. If you stay put, this is an opportunity for you to reset expectations and articulate your changing needs. Ask questions. If you get notified about a transition in your retiring advisor’s office, you want to know all your options. The office staff will likely be very busy managing the various processes and may not give you the attention your deserve. For the record, the advisors at NorthStar Capital Advisors are in their low 40s. In other words, we’re not retiring any time soon!